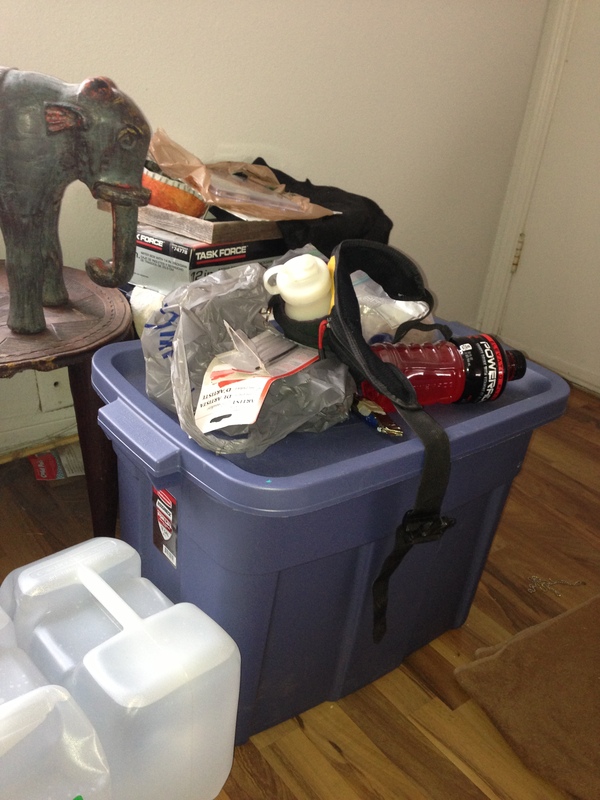 We keep the trail-running stuff in a big sealed Tupperware container next to the front door. It’s the usual assortment of lights and vests and fanny packs and handhelds and spare clothes and first aid and baggies and expired gu and duct tape and powders and potions and, oh, you know, trail-running stuff. I love that smell. And I love that container. It can call me Daddy-O anytime. Um… that smell is a petrified squirrel and vaseline. I fell for the ol’ “I think it’s in the bottom of my soccer bag Daddy-O” trick just this morning. Thank goodness there are elephants there. My first drop bag from Rocky Raccoon (before I knew it wasn’t cool to use a gigantic Rubbermaid as a drop bag and take half of your belongings with you to races) holds all of my things. It too has a distinctive, mildewy-Gu, outside sweat, let’s go adventure smell.